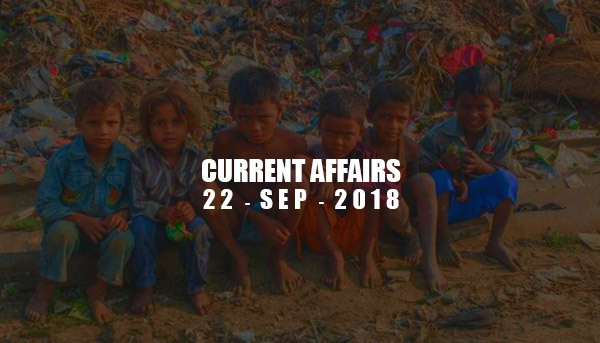 Current Affairs - Sep 22, 2018 - IAS - Daily Current Affairs, IAS Syllabus Exam Strategy, IAS Preparation. Individuals in a live-in relationship will once again be able to adopt children from and within India, which was earlier barred by CARA circular issued on May 31. India’s nodal adoption agency decided to withdraw a circular issued earlier this year disallowing them from doing so. India has ratified the Hague Convention on Inter-country Adoption 1993 in 2003. Over 270 million people in India moved out of poverty between 2005-06 and 2015-16. It is according to the 2018 global Multidimensional Poverty Index released by United Nations. The Report stated that India’s poverty rate came down to 27.5% from 54.7% during the period. In South Asia 546 million people (31% of the population) are multidimensionally poor, the report claimed. NASA’s Parker Solar Probe has beamed back the first-light data from each of its four instrument suites. Wide-field Imager for Solar Probe’s (WISPR) is the only imager on the probe to take the first images during its journey to the Sun. Over the next month, it will fly towards Venus, performing its first Venus gravity assist in early October. It will perform the closest-ever observations of the Sun’s outer atmosphere, called the corona. The mission may also ascertain why the Sun occasionally emits high-energy particles that are a danger to unprotected astronauts and spacecraft. The probe is named after Eugene Parker, a solar physicist, who first predicted the existence of the solar wind. India cancelled the meeting it had announced just the day before between external affairs minister Sushma Swaraj and her Pakistani counterpart, Shah Mehmood Qureshi, in New York. The reason of cancelled meeting was the brutal killing of security personnel by Pakistan-based entities and the recent release of a series of 20 postage stamps by the neighbouring country “glorifying a terrorist and terrorism”. E-commerce firms from 1 October 2018, will have to deduct 1% tax collected at source (TCS) under GST, before making payments to their suppliers. The World Anti-Doping Agency (WADA) lifted a ban on Russia’s anti-doping agency, RUSADA, this paved the way for Russian athletes to return to compete in all sports. Prime Minister Narendra Modi inaugurated the much-awaited Jharsuguda Airport in Odisha.